The Municipality of Tweed would like to announce that Poplars Golf Course will be the host venue for the second annual Hastings County Tourism Awareness Week (TAW) Launch Party. The event will be held on Friday May 10, 2013 and will bring together tourism business operators from throughout the County, political dignitaries, media, and other tourism industry stakeholders. "Tourism Awareness Week and the Launch Party is an initiative by the Hastings County Opportunities in Tourism (HOT) working group," says Joey Walsh, Economic Development Officer for the Municipality of Tweed. "The tourism sector is very important to the economic viability of Tweed and throughout Hastings County; we encourage all local stakeholders to come and celebrate tourism as well as learn more about destination development in our region". Kasey Pollard, Tourism Development Coordinator with Hastings County, explains "Part of our strategic plan identifies the need for more local awareness of the positive things that are happening in our communities because of tourism". "Following the launch party is Tourism Awareness Week, where we are encouraging stakeholders to host a special event or promotion and we will help promote you for free!" 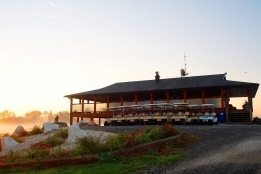 Owner of Poplars Golf Course, Jack Gorman states "As a tourism business operator we have been following and supporting the work of the HOT group, and are truly honored to host this year's launch party." "I would also like to extend a personal invitation to my industry colleagues, we are confident that it will be an enjoyable evening for all". The event will feature live entertainment, a putting contest, door prizes, finger foods, the launch of the new ‘Visit Hastings' website and interactive map, highlights of 2013 and the upcoming TAW week activities, as well as speeches from political dignitaries and a few select industry entrepreneurs as part of the ‘Creative Hastings Network'. Click here for more information.